My wife and I first got hooked on Half Priced Books during a random trip to Dallas Texas. I had heard of the chain before, but had never been to one. At that point we had a Garmin GPS and we punched “book” into the POI search and happened to find one nearby. From that point onwards when we went to a new area we immediately searched to see if they had any of the stores. During a trip to Madison Wisconsin we managed to hit three different stores up there, and on our last trip to Dallas I think we hit around fifteen of them. Tulsa unfortunately does not have any yet, but an hour and a half from Tulsa in Oklahoma City they have three of them in the metro area. So every now and then we make a trip down there just for the purpose of hitting all three of them. I was trying to explain to my coworkers what makes them special, and if you have never been… and especially if you not a bibliophile it just would never make any sense. 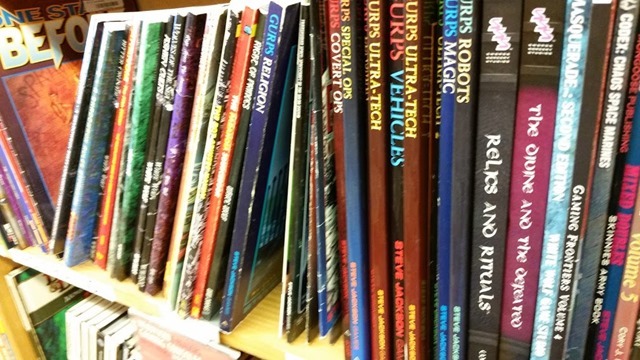 One of the most magic things about the store is they have a rather large used role-playing games section. On past trips I have found all sorts of wonders, but just the simple fact that a store exists in Oklahoma with this sort of stuff makes me happy. This trip I honestly didn’t walk away with much from HBP. I picked up a Minecraft book by scholastic, that is obviously targeting children but manages to explain Redstone wiring in a simple enough manner that I think I can “grok” it. Additionally I picked up the second book in the Odd Thomas series, and the Silent Hill Collection for the PS3 since I have never actually played 2 or 3 in that series but loved the hell out of the first one. Another thing we did yesterday was run around to a series of pawn shops in my search for “cheap” Xbox 360 and PS3 games. I managed to stumble onto a cache of $5 a piece PS3 games here in Tulsa at a Cash America pawn shop, and I knew that in OKC they had at least 11 of them. We tried to hit as many of them as we could while weaving across town to hit all three of the HBP stores. The lesson of the day seemed to be that OKC wanted more for their stuff than I was willing to pay for it. Locally the most you will ever pay for a game in a pawn shop is $15, and while wandering across OKC I routinely saw them for as much as $30 in the same pawn shop chains we have here in town. I even managed to hit a Game XChange which is a chain that used to be really big around here… and there they were selling PS4 games that you can buy brand new at Target for $39.95 for $54. When I see a price like that, maybe it is horrible of me… but the first thing that goes through my head is “that’s adorable”. I feel like maybe Oklahoma City in general just doesn’t know how to price things. 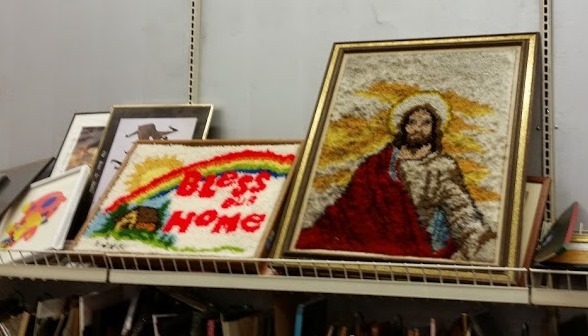 During our travels we stumbled across a fairly nice looking thrift store and the carpet jesus picture above hails from it. 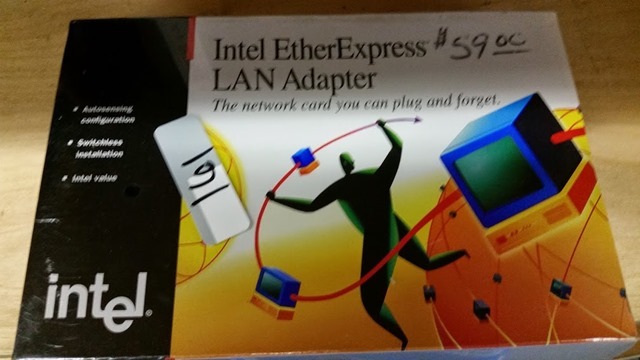 Among the various baubles is a brand new sealed box for an Intel EtherExpress LAN Adapter. The one pictured above is an ISA card… designed to go in an IBM 286/386 machine and Novell Netware that is advertised on the back side. This is pretty much the best technology Intel had to offer in 1992, and seems to be pulled off the shelf of someone’s closet and donated to charity. The pricetag is not a mistake… they apparently do want $59 for this mint in box artifact of the pre-internet age. Oklahoma City apparently lives in a bubble where they don’t have a clue what anything is actually worth. This morning I woke to the fun surprise of having no internet in our house. Apparently between the time that I recorded our podcast and edited it last night, and this morning our Asus router died. The thing is we are exceptionally hard on routers it seems, because it seems that at least once a year I end up replacing one. I have to think it is because we have so many internet connected devices. We have 5 laptops, 3 desktops, 2 phones, 2 tablets, 3 chromecasts, and 5 gaming consoles connected to our wireless router pretty much all of the time. That is a lot of strain on any device and they seem to just explode after awhile. So this morning I connected the internet directly into my main desktop and got on long enough to do some research and write this blog post. I found a device at our local Best Buy that looks like it might do the job. It is supposedly designed to handle multiple devices at the same time, so we will see if we end up killing this one as well. The last one only manages to survive 6 months… and honestly it might still be under warranty and I will try and dig that information up and try and replace it. It would make a nice little router for the lake to be honest. I did the in store pickup option on the new one, so right now I am just waiting on the email to let me know it is ready to go. I had heard really good things about the Netgear Nighthawk, so we will see if it lives up to the marketing hype. Last night we managed to get the entire AggroChat podcast crew together once again for another broadcast. Tonight we talk at length about the various things we have been doing including Minecraft, VVVVVV, Adventure Time Battle Party, and a few other things. The bulk of the show however is a discussion about various subcultures. Gaming and geekdom in general can be a very exclusionary place. Not that we solve any of the worlds problems, but we at least have a discussion about them. We ran a bit longer than normal this time, but we had a lot of stuff to talk about. This mornings blog post is likely going to be a quick and abbreviated one as we need to get on the road soon. The wife and I are going off to Oklahoma City today in search of the illusive Half Priced Books store and my mission for the day… lots and lots of Cash America pawn shops. Last weekend I managed to pick up some amazing deals on used PS3 games at that chain, and there are far more of them in OKC than here in Tulsa. Basically I am cheap, and I would love to pick up more PS3 and Xbox 360 games… but I only really want to pay $5-$10 for them. I had a blast playing Fallout 3 on the PS3 even though I had played it countless times on the PC, so I would be interested in visiting lots of titles I had played on the PC as well. In part because playing on a console is so easy… you pop the disc in and go. The negative however is that you can never really improve the experience. Example here is a modded up version of Fallout 3 that greatly improves the look and feel. Seeing this yesterday pretty much guarantees that I will play through the game at least one more time on the PC as well. Another prime example of better living through software is the whole Skywind project, where they are completely redoing Morrowind using the Skyrim engine. These things will never be able to function on a console, but I have to admit there is something nice about the simplicity of just pressing play. My only complaint right now is that I wish the modern generation of consoles would allow me to install the disc to the hard drive and then not have to worry about having the disc any longer. That is the thing I like the most about my PlayStation Plus titles, the ability to have lots of them “on tap”. Most of last night was spent working on my extensive tunnel network… or what will soon BE an extensive tunnel network. Across a bridge from my main building is the first area I started out that I am using as some what of a stone quarry. At base floor I started a tunnel to see just what I might intercept digging in a straight line. Generally speaking I dig 3×3 tunnels because they feel about right, not too closed in and not too open. 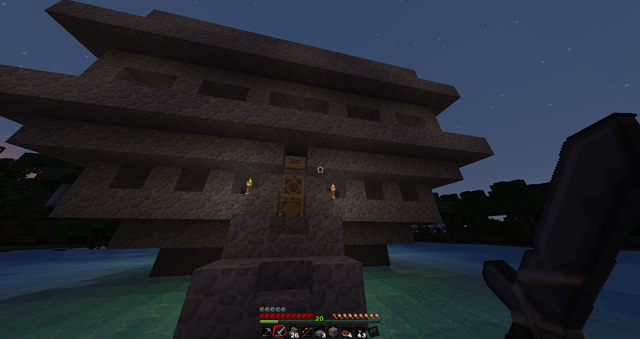 After quite a ways of torching every 7 blocks I came out on the other side in what appears to be a riverside valley. There is a cobblestone wall there so I am not sure who has been building in the area. Hopefully I am not impeding on someone else’s land too badly, but I like as many entrances and exits from my area as possible. I built up a really simple fenced in area so that hopefully I won’t end up with too many creepers lurking there. One of the interesting things about the lockette mod we are using is that supposedly if you lock a wooden door it makes it so that zombies cannot beat it down. Traditionally I have used fence gates to bar entrance into my areas, because villagers cannot open them and zombies cannot break them. However I have started trying out the whole locked door thing to see if it works. I am not purposefully really trying to keep people out of my stuff, but more that I don’t want to come home and find everything full of mob spawns. The other thing that I worked on last night was redoing the approach to my house. I ended up extending the path to make it far less likely for me to kill myself trying to leave it by hitting lots of cactus. This almost happened a few times as I seem to be unable to walk a straight line. Essentially I started the dual tier row of cactus a block further out so I have a 3 block walkway to get in and out of my area. I might add a third row of cactus because I actually managed to have a creeper make it through earlier. Granted the creeper only took a single hit to kill after being chewed up pretty badly by the cactus to get to me… but this in part was because some of the cactus has not fully grown to 3 block height yet. 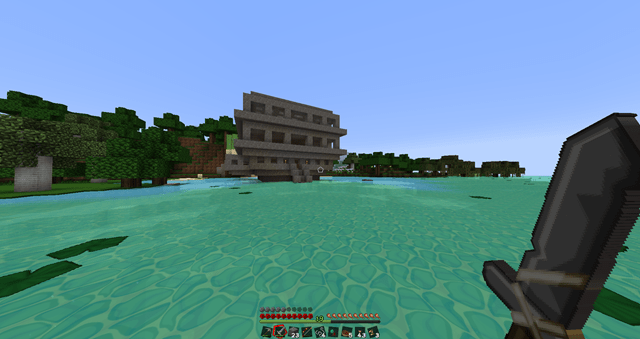 The creeper was able to hop up onto a single block height one and use it to make his way in. Now that I feel like my base is fairly defensible, it is just about time for me to start back working on the “mine to bedrock” project. 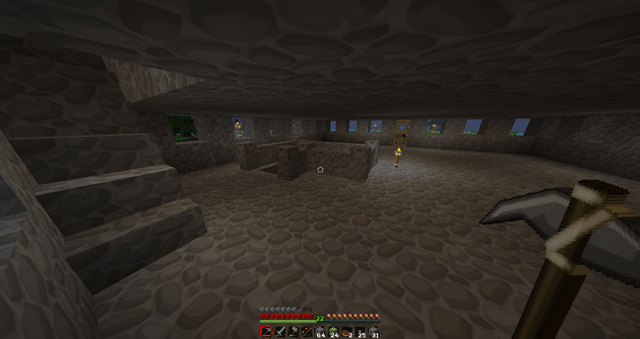 Essentially in every build I have done in Minecraft I eventually create a tunnel network that goes all the way to bedrock and start branch mining for diamonds. It is my hope that I picked a decent spot to mine, because so often you get down to bedrock and struggle with lava. Right now the project has been derailed in that I hit a fully enclosed cave system, but I need to build my way through it and continue digging. So far I am finding playing on the Alliance of Awesome server to be fun and refreshing, since more or less I am having to play legitimately again. If you are interested ping Zelibeli and she can get you white listed… but of note this is open to existing members of the AofA community and its requisite groups. This morning I am shambling around the house in a zombie like state. For whatever reason I seem to have not slept well last night. I remember waking up at many moments to either kick the covers off or freezing and cover back up. My wife has wondered if she is coming down with something, and I am honestly starting to wonder if this is something more than just allergies. All I know for certain is that I could not seem to regulate my body temperature last night, and the constant pile of cats didn’t really help with the ability to get comfortable. I generally had one pinning my legs down and another stopping me from rolling over, while a third fought for control of my pillow. I enjoy the hell out of my wife. She can fall asleep without any preparation and tends to sleep all the night through. She can fall asleep at like 8 pm and then transfer to the bed and continue sleeping the rest of the night through. I wish I could do that, but if I take a nap it completely destroys my ability to sleep that night entirely. Additionally I never can seem to functionally get more than four to six hours of sleep in any given night. The result of too much sleep is pretty much the same as not enough sleep for me, resulting in a morning much like this one where I have trouble stringing contiguous thoughts together in my head. Last night I spent most of the evening plugging away on building my base on the Alliance of Awesome server while watching season four of Farscape. I had a simple mission last night, to figure out a way to protect my base from invaders that all too easily could drop down from the cliff above or jump across from the trees nearby. As a result I harvested copious amounts of wood surrounding the cliff to remove the ability for them to perch on top of the trees and drop down from above. The main mission of the night was to find some cactus. The area the spawn is near is a mixture of heavy forestation and to a lesser extent swamp land. While we have an ample supply of cows and horses there was no readily available desert biome. As a result I started going on these daytrips out as far away from my base as I could before eventually teleporting back using the /home command at the last possible moment before nightfall. While the majority of these were mostly futile it did allow me to stockpile the various things you can get from killing animals and I have a 50 stack of steaks that should hold me for some time as well as a lot of chicken and ham. In fact I brought home so much of it that I had to break down and build several more furnaces so that I could cook each meat at the same time. During my evenings in game I would work on harvesting out the hillside quarry that links up to my fort out on the water. On the four trip out I was getting to the point where I thought maybe just maybe there was not a convenient desert adjoining the biomes in any direction. I had crossed every other imaginable biome, except maybe deep jungle when I started to stumble into what looked like a savannah. Then on the far side of that I started to see some sand dunes. I was starting to get a little edgy however as the sun was extremely low in the sky, which mean I did not have very long at all to harvest any cactus I happened to find. So as night fell I wandered around the desert gathering up whatever I could get. A warning for anyone who heads to that desert… it seems to almost entirely be spawned with endermen. I gathered up around 30 blocks of cactus and ported out of there with the /home command. I wish I had taken more screenshots but I was in a rush to get the resources I needed and get out of there. In the Savannah region there was what looked like an abandoned safari hut. I would think it was a player creation, but there were absolutely no torches anywhere and it was completely open up on one end. I am wondering if this is a new type of prefab since I last played the game. There were no resources in it other than a crafting table that had been embedded into the floor. That is one of the things that I find most interesting is that since I have not played much minecraft in a long time, there will likely be a ton of things that are new to me. As you can see in the above photo I installed a row of cactus as a defensive barrier to stop things from either being able to scale the sides of my base or drop down from the cliff above. It doesn’t stop the spiders from trying, because every night there is at least one that suicides down on the cactus dying well before they make it into the base. Right now I have a pier or sorts that connects the door into my base to the landmass and I am thinking about putting a line of cactus there as well. It does an amazing job of blocking bad stuff from getting to your base. 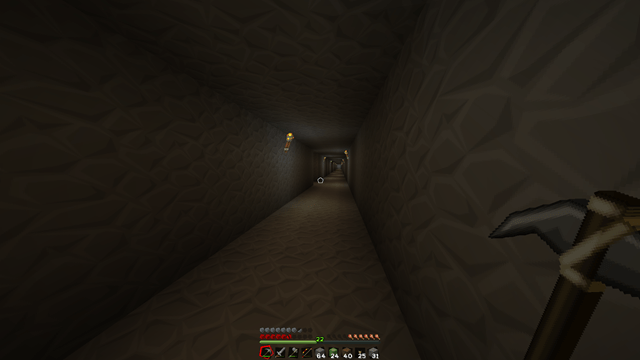 Right now I am also trying to tunnel towards the spawn so that I can hopefully have a route to get back there if needed. I’ve started my mine down to try and harvest some diamonds, but that plan fell apart completely when I broke into a rather shallow cave complex. There is still a ton of iron and coal that I need to harvest out of that at some point and sure up the stairs so I can continue to go down past it. Like any Minecraft session I have more projects that I have focus to complete them. At some point I want to expand the main tower structure to go up into a lighthouse of sorts. In order to carry that off I am going to need either some lightstone or some netherrack… which both mean a trip into the nether. Which also means that I need to find plenty of diamond, and use it to harvest obsidian. There is quite a large amount of surface spawn lava nearby so that shouldn’t be a huge ordeal to safely harvest obsidian. In any case… I seem to be obsessing about Minecraft again. At the point I am writing this blog post we are roughly 24 hours from the launch of Elder Scrolls Online. If you are really curious about the exact time… someone has created a page dedicated to that… with Europe Final Countdown playing embedded of course. Last night I made it to bed at a normal hour… or at least normal for me, but this morning my body conspired against me and decided that 4 am was time to wake up. While I had not planned this, it is actually going to feed into my idea of being up for the launch the moment the servers open. So tonight I will be heading to bed early, and trying to wake up in time for the launch in the morning. I normally get up at 5:30 in the morning during the work week, so really this will be good in the long run since Monday will not be quite so hellacious. I have to say at this point I am completely amped, but also nervous. One of my favorite and least favorite things about a new game is pulling together the guild. It is always a struggle to make sure everyone is rolling in the right place, with the right faction. There are always opening day adjustments as you shift this thing or that, and trying to deploy the logistics to be able to get everyone moving in the right direction. 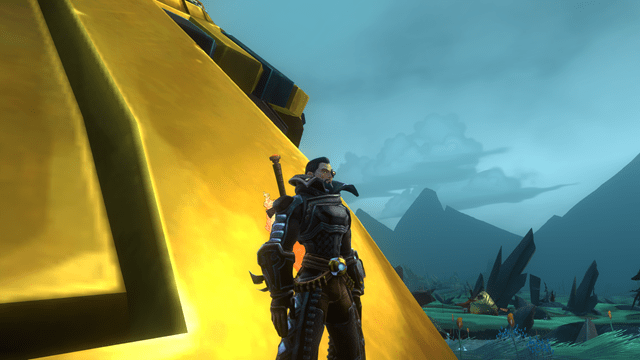 This is by no means my first launch pulling together a guild, and likely it will not be the last either. No matter how much experience I have in making things work… I still get the jitters hoping it all goes off without a hitch. 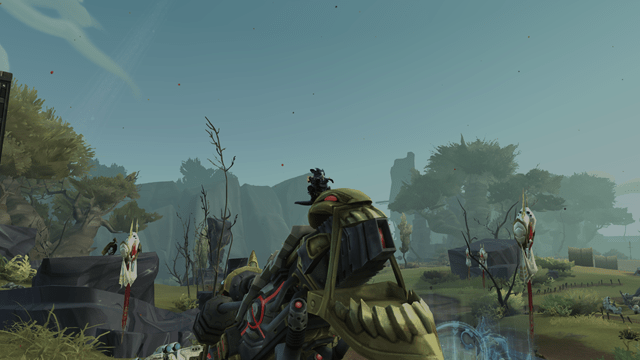 SWTOR was without a doubt the smoothest, since we were able to create the guild before launch through their web based tools, but even then there was plenty of confusion among the folks that were too lazy to sign up before the guild placement happened. I thought I would devote this mornings post to getting everyone ready for the big event. There are several things about this launch that should make things significantly easier. Firstly there are no servers to worry with, there is the North American mega server and the European mega server. I do not however know if characters cross over between the two. We will be focusing on the North American mega server for this, and I am hoping that our European friends will have decent lag there or even be able to roll there at all. Have I mentioned how much I hate regions in video games? House Stalwart will be aligning ourselves with the Daggerfall Covenant, as was decided in a poll that ran some time ago. This means that in order to play with the guild and group easily, you also need to roll Daggerfall Covenant. Guilds span factions, but it is logistically impossible to group together at low levels if you are of two different factions. Thanks to the preorder bonuses however you will be able to roll any race in any faction. If you did not preorder, then grats… if you want to play with the bulk of the guild you have to play either a Redguard, Breton or Orsimer. Really if you were interesting in this game at all, you should have preordered to long before this point to make sure you could have that very important preorder perk. 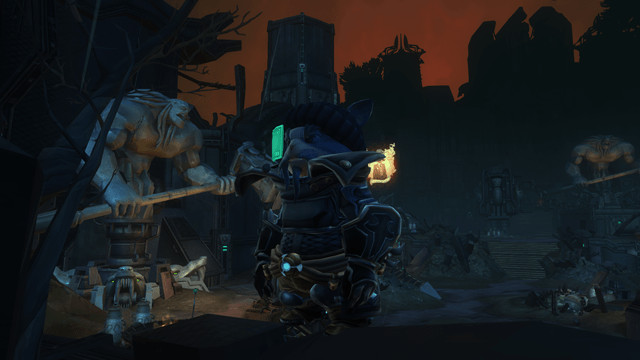 Those who did preorder… I am sure we will see plenty of elves in our guild as a side effect. Most of the people I know going cross faction classes are doing so in order to play a Bosmer, Dunmer or Altmer. I personally will be rolling an Imperial because it is the race that best fits the character of “Belghast”. As I said earlier, my goal is to be up at the time the servers go live and get the guild created asap. One of the cool things about Elder Scrolls Online is the fact that you can friend people at an account level. The easiest way to get invited to the guild is to friend @Belghast, as the game uses a system similar to twitter. My goal is to get several people who can do invites in the interim and then deal with creating a formal “officer” structure later. Additionally I will be using the Alliance of Awesome Reddit thread to organize invites for the “new to Stalwart” crowd. For those who have access currently to our mumble server, I will be streaming the launch tomorrow in the “Bel is Streaming” channel. So that is a really quick way to get invited is just to pop into the channel and ask for one. The only other real decision looming on the horizon is what campaign we want to choose for Cyrodil. There is a thread up on the Elder Scrolls website listing the various campaign names. At this point they are all named after the iconic weapons that you get in the Elder Scrolls series by doing quests for the various Daedra. As a result some of them are going to be far more popular than others. I would imagine that Wabbajack would fill up before any of the others, thanks to the fond memories of Sheogorath. Other names will appeal to the “sounds cool” crowd, and Auriel’s Bow will be full for the “I pick whatever the first name is in a list” crowd. Right now I am thinking either Volendrung or Dawnbreaker might be good options. Both are iconic weapons, but also not as iconic as say the Wabbajack. However this is something we can decide later. If you have any questions feel free to post them here, or over on the Reddit Thread, or via Twitter, or ask them the day of via Mumble. It is my goal to make this as clean and orderly a process as possible. There are always some issues with any game launch, but hopefully thanks to the copious amounts of stress testing we have done to this game… it will go nice and smooth.